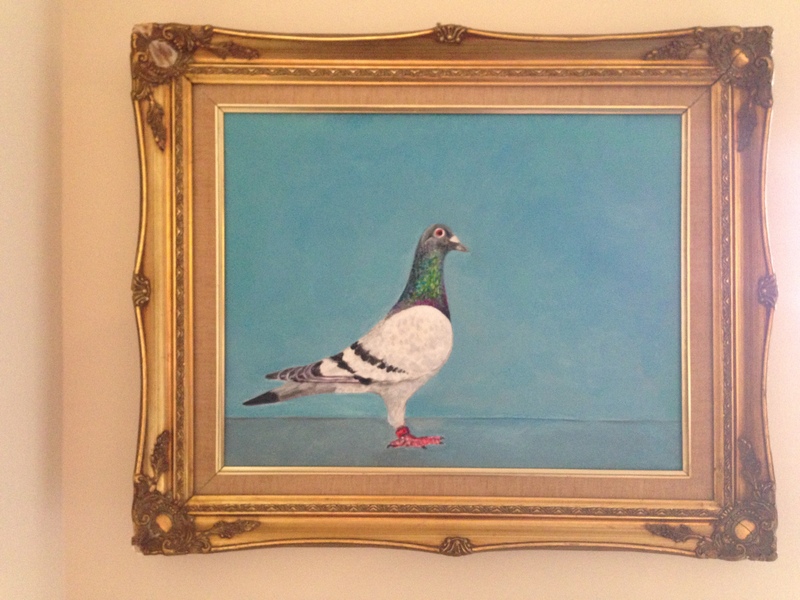 Inspired by some other pigeon art, I set out to paint my own. I painted this little guy on canvas board with acrylic paint. I found the frame for $1 at a yard sale. $1!!! Score! 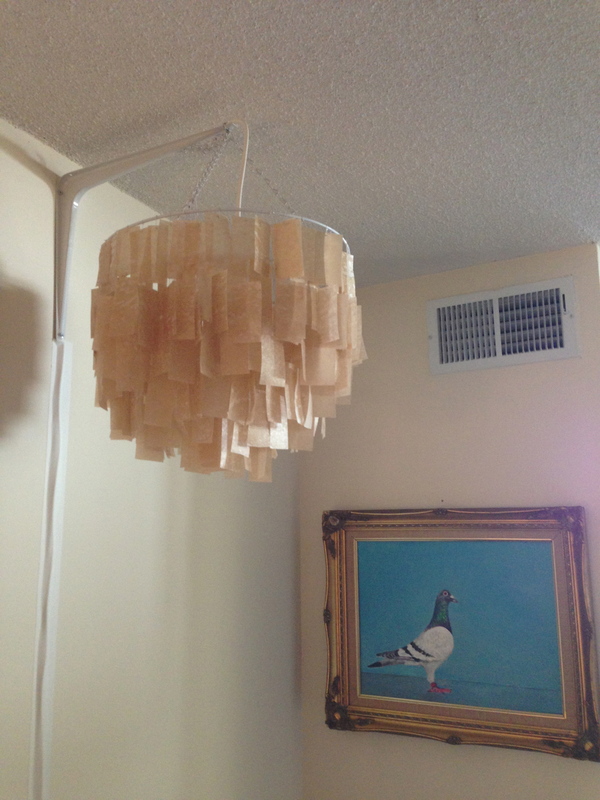 Here it is in the corner, with my new hanging lamp (post about that forthcoming). He makes me happy. I think he needs a name. 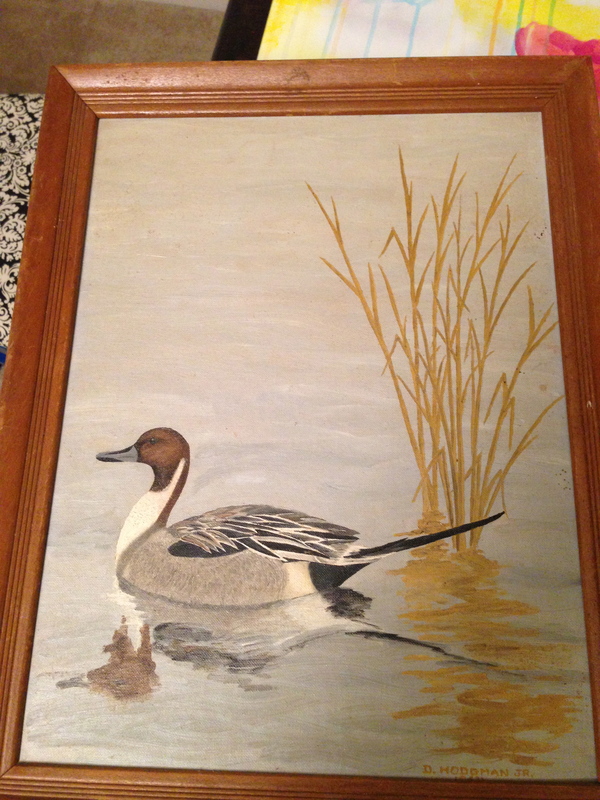 I may also paint him a friend yet… Obviously I need lots and lots of bird art. More bird art! Also, I had an idea that may already exist. If it exists, someone please let me know. I would like to exchange some of my original art with someone else’s original art. I desperately want original art by some other artists, but I cannot afford to buy it, and I think there is too much of my own art in my apartment. Does some sort of art swap exist? 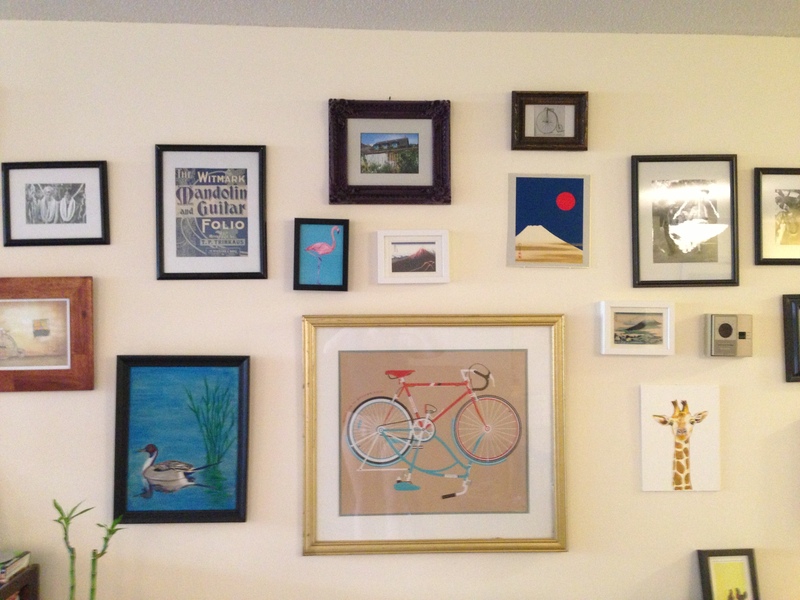 If anyone is interested in an art swap and in the DC area, please reach out! 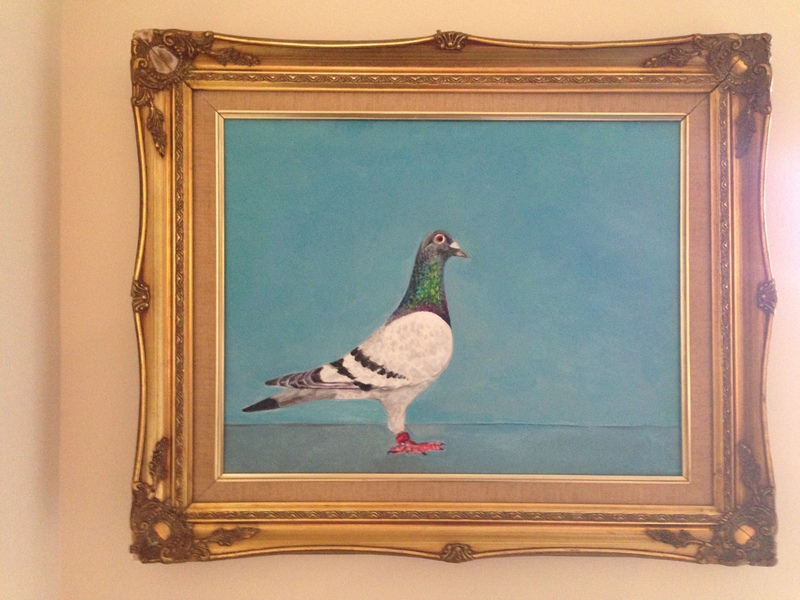 Posted in Art, Decor, DIY, Painting and tagged Art, Art Swap, Paint, Painting, Pigeon. Bookmark the permalink. January is definitely the month of self-improvement, or at least affirmations of self-improvement. I guess I’ve jumped on the bandwagon. This post will, therefore, be rather self-indulgent and fairly meander-y (because after a long day at work fighting bad guys, the last thing I want to do is write up an outline for a blog post). Something that I’ve been struggling with lately is feeling dissatisfied with what my apartment looks like, and letting that make me really depressed. Yeah, it doesn’t look like a picture out of HGTV. And yeah, it’s a work in progress. And no, I still don’t have art for over the TV. But what I want to focus on is not what is wrong with my apartment or what I want to change. Rather, I want to focus on what is working and try to find more ways to make moments that are working. On step I am taking in this direction is participating in Apartment Therapy’s January Cure. So far, I am really digging it. It’s a realistic way for me to make progress on getting my apartment in shape, but not in a picture perfect way. Just in a normal people, with normal lives, trying to make their homes a little more beautiful. After just scrubbing the crap out of my floors and vacuuming behind and underneath furniture I don’t usually move, plus adding fresh flowers, my apartment already feels a million times better. Who’d have thunk? Sort of in the vein of being happy with what I’ve done instead of focusing on what I want to do, I am sharing pictures of my bar area. I’m happy with how this “moment” in my apartment looks. Everything in it was either thrifted, DIY, or is an heirloom. My GREAT GRANDMOTHER made that charcoal horse drawing. I’m obsessed. It’s still in the frame I got it in, because I’m scared that if I change the frame, the picture will disintegrate. This came into my life just at a time when I was really wanting more horse art, and the fact that it’s an heirloom (I have only one other real heirlooms), well that was awesome. I painted the little owl painting, and blogged about it here. I found the small deer antlers at Brooklyn Flea for $20. I MADE both the deer and moose taxidermy. It’s papier mache, and I’m pretty stoked with how it came out. I will try to post a tutorial soon. I got the dresser for $35 on craigslist and the distressing you see is REAL distressing because that’s exactly how the paint chipped just from being old. No faux distressing for me. I’m currently debating repainting it, but part of me loves the original paint finish. Here’s this area all dolled up for the holidays, with a garland of pom poms and bells that I made (tutorial from A Beautiful Mess). Happy New Year, my dear readers! I am so glad you are on this journey with me. Posted in Art, Christmas, Decor, Decorating, DIY, Furniture, Thrifting and tagged Art, Decor, Decorating, DIY, Taxidermy, thrifting. Bookmark the permalink. OK. She is technically not a painter, but since I have started this new bit on my blog called “Painter’s Crush” it just seemed easier to call this another part of that segment, even though she’s a photographer. Disclaimer over. I have another new painter’s crush: Leila Jeffreys. 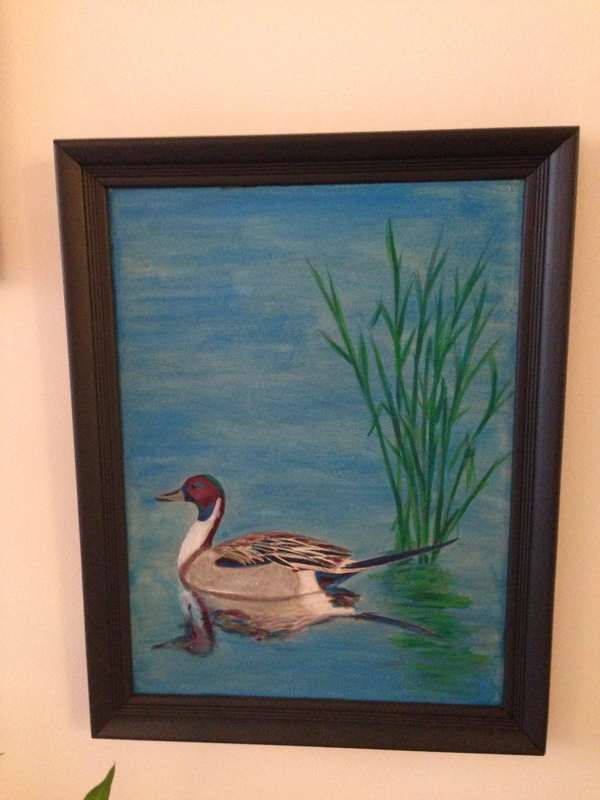 And yes, her artwork also features birds. Yes, I know I have a weird thing for animal art as shown by giraffe, blue rhino, and recent painter’s crush on Matt Adrian. To provide some context, here is one of her photos in a lovely Australian home. The scale is just perfect. Posted in Art, Decor, Decorating, Painter's Crush and tagged Art, Decor, Decorating, Leila Jeffreys, Photography. Bookmark the permalink. He’s been famous in the art world for a while, but I just discovered the incredible work of Matt Adrian. I fell down the rabbit hole of his artwork for quite a while. Time well spent. I’ve got a new painter’s crush. Boyfriend and I were in Portsmouth, NH, for some autumnal voyeurism (AKA looking at the changing leaves) and walked past an art gallery featuring Matt Adrian’s incredible paintings of birds. Unfortunately, we couldn’t go into the gallery because it was late at night and already closed. Boo. But I took a quick pic of the name of the artist so I could later look him up. And O.M.G. Love. First of all, I really love animal art – most of my favorite art features animals. And bird art is no exception. Second, his paintings are beautiful. The colors and compositions are just lovely. Third, his paintings are not only beautiful, but they have clever and amusing titles. The titles are almost like little lines of poetry, but funny. Some of the titles left me actually laughing out loud. This is a link to more of his artwork, which includes all the hilarious titles. Check it out. I hope you enjoy as much as I did. Posted in Art, Decor, Painter's Crush, Painting and tagged Art, Painter's Crush, Painters, Painting. Bookmark the permalink. All part of my master plan to Karaoke with my readers all over this great nation. I mean, would you look at those colors? And how fast and loose Cy goes with the paint? All of these photos are from this website – which has a huge gallery of his work. Worth checking out. Not all of his work is as colorful as the ones I selected, but I liked those ones so much. Since I obviously love bright colors – no surprise there, faithful readers. I think that if I died and was reincarnated, I would like to come back as a macaw or a flamingo, or maybe a peacock (a male) because I want to be as bright and shiny as possible. Oooh – or an octopus: did you know octopuses can change color and texture? I would fit in anywhere! Hope you like Cy Twombly. I am really digging his stuff right now. Posted in Art, Decor, Painter's Crush, Painting and tagged Art, Cy Twombly, Painter's Crush, Painting. Bookmark the permalink.